Description of "Barvai Ramayan of Goswami Tulsidas"
‘Barvai Ramayan’ is an abridged version of the famous epic known as the Ramayana which narrates the story of Lord Ram, a human incarnation of the Supreme Being. It consists of sixty-nine 2-line verses composed in the poetic style known as Barvai Chand in Indian literature. A ‘Barvai Chand’ is a rare type of poetic composition in Hindi literature that only an expert can write because of its difficult texture that needs special skills with the letters, the words and the vowel sounds of a language, as Barvai Chand prescribes specific number of letters, words and vowels sounds for each of its lines. So therefore it is hard to come across a book written in the style of a Barvai Chand. At the same time, it is also considered to be a beautiful mode of writing poetry because if properly composed and rendered it is mesmerizing to hear for the listener. As is common with all the versions of the Ramayana, the Barvai Ramayan too has seven Chapters or Cantos, each known as a Kanda. 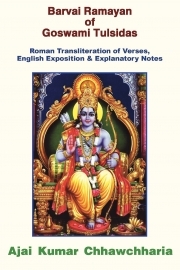 The uniqueness of this book however is that while the life and deeds of Lord Ram are covered in six chapters, from Chapter 1 to Chapter 6, i.e. from Baal Kand to Lanka Kand, the spiritual importance, the glories and the greatness of the Lord’s Holy Name are extolled in the last Chapter, i.e. in Uttar Kand which is Chapter 7. This pattern has also been adopted by the saint-poet Goswami Tulsidas in his another book titled Kavitawali. It is a pattern that is often the way ancient religious texts and books on spiritualism were written in India, such as the Vedas and the Purans, where their philosophical and spiritual messages were conveyed at the end of the book. Reviews of "Barvai Ramayan of Goswami Tulsidas"